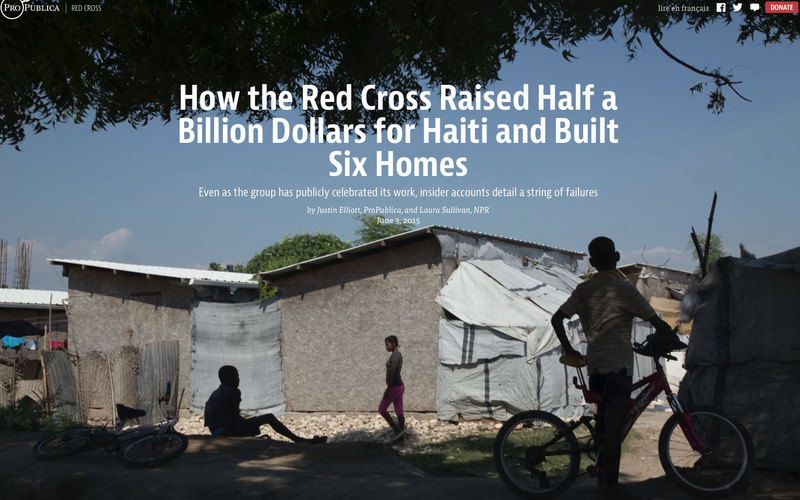 Just by reading the title, you will notice it is a pretty strong attack on ARC, and unfortunately, it sheds a pretty bad light on all Organizations working in Haiti. Here is ARC’s initial response, along with a more direct facts vs fiction that unfortunately don’t help much contextualizing some of the responses, which is very much needed for a more general public. I also wanted to share a good article by the Guardian on accountability of international aid. The goal of this post being to share some of the latest prints, I will follow up with a couple of other posts to reflect my perspective and hopefully a more contextualized point of view, having lived in Port au Prince for two and a half years and worked o housing reconstruction and urban rehabilitation in Haiti for over three years now. > HOUSING is much more complex and goes beyond building homes >> As I like to state “housing is a process and not a product” . This makes me highlight the narrowness of solely quantifying reconstruction efforts to “how many houses were built” and potentially ignoring the qualitative. Enabling is a bit part of it though technical assistance programs, training, empowering communities, local governance aspects, etc., which in my opinion ends up having a greater impact and change in culture at a community level than simply going in and building four walls and a roof. In this particular case, ARC stepped away from actual housing reconstruction in favor or housing repairs and other strategies to support housing in neighborhoods. The article barely mentioned housing repairs and the work done around the latter, which I know became the focus of the Lamaika project (working with another NGO called Build Change on that). > Development work is about partnerships and filling gaps and thus collaborations and outsourcing/channeling the funds pertaining to specific parts of the projects to particular organization focused on the subject matter is not a bad thing. it would be ridiculously costly to build up a team from scratch. That said, when one can’t do it with local organizations/private sector because neither the capacity, knowhow nor the interest is there, then the outsourcing goes to other international organizations… of course, the whole intent is to, when possible, build the capacity locally so it remains in the context and thus allows continuity an replicability. > Granted there is an overhead involved (and these are sometimes a bit too high- agreed)- but overheads are necessary as they pay for people’s salaries, for the resources and processes that allow an organization to function. Like any other entity – even in the private sector- there are basic costs to cover. Although the private sector is usually profit driven, these organizations are usually nonprofit but they do have multiple layers of fees to go to their various bureaucratic structures (not defending them at all but just to say they isn’t just ARC). Also, there are compensation factors that need to be taken into account for people that come internationally -for ex. Haiti si a non-family post, and thus there is home leave to allow employees to go back to their countries and see their families, etc. > Land tenure has in fact been a challenge for reconstruction efforts– the majority of the reconstruction in Haiti – being an urban disaster-has taken place in very dense informal settlements. As the government started backing up/coordinating reconstruction projects, their strong desire not to ‘foment’ informality and an outdated inflexible, very formal legal framework (that does not respond to the current realities on the ground) lead initially to a very dogmatic discourse around legal tenure and unfortunately not around security of tenure (in this particular case regularizing or seeking a right of occupation). Things have evolved a bit, but it has taken quite a while with various hurdles…and still more to go. Also, with such an informal land titling situation, little to non-existing cadastre, not having legal access to land to build on, even though the land may be squatted on already- created very high risk situations that blocked many organizations (once again something that reverted them back to the legal tenure discourse). > Not having the general know-how and resources within an organizations has proven to be an issue for many- suddenly many of the organizations working in Haiti, when jumping into reconstruction, had to become architecture and planning firms, but necessarily haven’t the flexibility, internal resources or capacity to do so. I truly do believe that this is one of the reasons why certain organizations were actually able to move forward substantially as they had the capacity to quickly adapt and grow the teams and thus orchestrate the multiple dynamics around housing and urban rehabilitation – social mobilization, local governance, tenure aspects, design, micro-finance, training programs, institutional support, etc. I will leave it there for now, but hope to follow up with more thorough pieces that can relate a btt more to the context. Stay tuned and I welcome you to join the conversation by commenting!